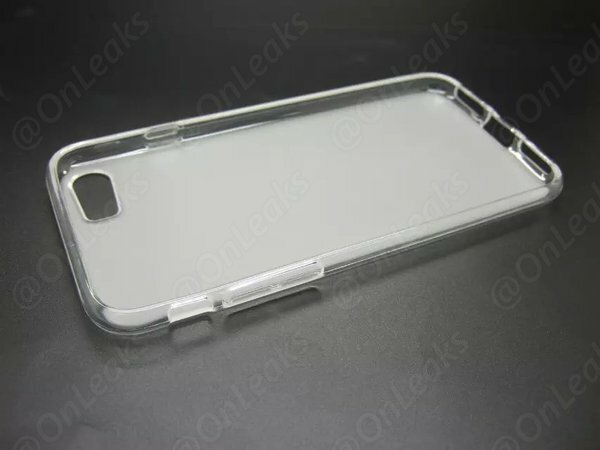 While the iPhone 7 is not expected to launch until September, French leaker Steve Hemmerstoffer has shared photos one of the first cases prepared for Apple's next-generation flagship smartphone. The case has a larger cutout for either a traditional camera and LED flash setup, or possibly dual cameras. There are also two openings for stereo speakers in lieu of a 3.5mm headphone jack on current iPhones. The aftermarket case's form factor closely resembles an iPhone 6s overall, with cutouts for a possible all-in-one Lightning connector, pill-shaped volume buttons, and side-facing power button in their traditional places. Early case leaks have historically been fairly accurate indicators of new iPhone designs, though there have been a few notable exceptions. 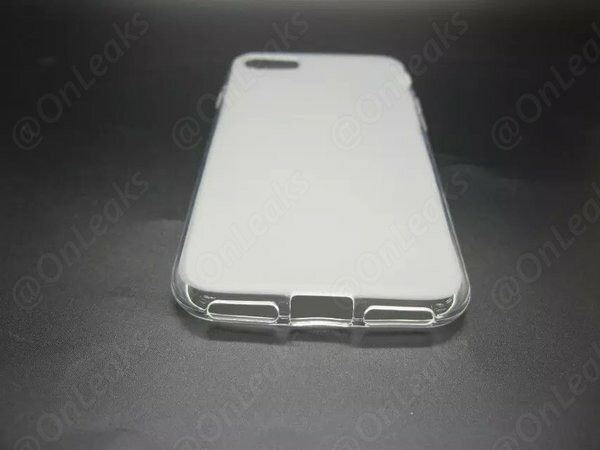 The first cases for Apple's purported iPhone SE also surfaced last week ahead of its expected March 21st launch. Multiple rumors have also claimed the iPhone 7 will feature a dual-lens camera system. The hardware could be based on technology Apple acquired from LinX Imaging, which could lead to brighter and clearer DSLR-quality photos and several other major advantages for the iPhone 7 cameras. Meanwhile, Barclays analysts believe the iPhone 7 will have dual speakers supplied by Cirrus Logic, an Austin-based provider of analog and digital signal processing components for consumer electronics. Stereo speakers could be louder and route audio signals through two channels to simulate direction perception. Update: A previous version of this article said the case has a cutout for dual cameras, but the opening may only be large enough for a traditional single camera and LED flash setup. Some rumors claim the dual camera setup may be exclusive to the iPhone 7 Plus, which reportedly may be called the iPhone Pro. Lightning to 3.5mm headphone jack adapter available. Yours for only $69.99! So, there's room for stereo speakers instead of a 3.5mm audio pin. I love it. i wonder who the board will appoint as CEO to bring back the 3.5mm pin for the 7s. Yep, stereo speakers 20mm apart. Great. There have been plenty of incorrectly designed cases in the past. Just because some Chinese knock-off shop makes a case now everything is fact huh. Still 6 months before the 7 is announced and a couple months before it's finalized and goes into production. Anything at this point is simply a guess and far from fact. The media is going to go nuts if the design stays largely the same! Four years is too long for the same design. Where is the jack for headphones? If Ive uses the term "revolutionize" for removing the 3.5mm audio pin, I'm going to vomit. So looking forward to Apple's presentation exholing how they were able to squeeze two tuna fish cans into the case for the tinest sounding iPhone yet AND now with stereo distortion. Yay! Another device to worry about keeping charged. Maybe Apple will increase the quality of sound? And at the same time increase Apple Music sound quality, this would be a good reason to remove the headphone jack. Apple LOVE people like you. * Audio on an iPhone starts compressed digital audio. * The audio is then "decompressed", and you get a series of 1's and 0's in raw digital format. * This data is then fed into a chip known as a DAC (Digital Analogue Converter). * You can get cheap crappy DAC's or high end expensive DAC's. Apple generally uses higher quality DAC's, although it has been noted the 6S has a poorer quality DAC to the 6. However, having said that, unless your headphones are ultra sensitive, it probably won't bother you. * The signal that emerges from the DAC is analogue audio. * This is then fed through an amplifier circuit in the phone, through the 3.5mm jack, to your headphones so you can hear the audio. Where I've highlighted the text, is where the quality is established. It has sweet nothing to do with the jack. Now lets repeat the same journey with a Bluetooth headphone. * Digital audio is then passed onto the Bluetooth controller on the phone. * Luckily, Apple supports AptX which offers a much higher quality codec stream, so audio is re-compressed into this format and transmitted over digital radio signals. * Not all headphones support AptX, so if this happens, the re-compressed audio will lose quality at this step. * The digital radio signal is then received by the bluetooth headphones. * The bluetooth controller on the headphones decompresses the audio back into an uncompressed format. If AptX is used, the quality should more or less mirror the original, however if not, there will be loss of sound quality. * The uncompressed audio is fed through a DAC at this step. * Once again, you can get cheap crappy DAC's or high end expensive DAC's. I can't imagine generic headphone manufacturers using high end DAC's so unless you have some high-end headphones, there will be another loss of quality in sound. * This is then fed through an amplifier circuit within the headphones. * Cheap headphones will have poor isolation of amplifier circuitry so it may add "noise" to the analogue audio. * The analogue audio is then fed to the speaker drivers so you can hear audio. Lightning connectors will work in exactly the same way apart from the bluetooth digital radio transmission. So if you worked it out, you will realise there are more points of audio degradation using Bluetooth or a lightning lead. It'll also increase costs for headphone manufacturers but since consumers want the same prices as before, they'll sacrifice in quality because generally, "the consumer doesn't really care about quality". On top of that, Apple will gain huge revenues through the licensing of the proprietary lightning connector and of course headphone manufacturers will pay through the roof to have "Made for iPhone" added to their boxes. Finally, all the lemmings who blindly follow everything Apple say, will go out and buy a new set of headphones for their phone. Apple makes a big short term gain on revenue. Ultimately it's a mugs game. In the past, Apple stood for quality. Now it's just a generic product designed to generate billions in revenue for consumer lemmings.